시리아의 화학무기 공격에 대한 미국의 단호한 대응은 중국 뿐 아니라 북한에 충격이었다. 그동안 유엔에서 이뤄진 의미 없는 토의와 결의안, 비난의 말을 벗어나 트럼프의 예상 밖의 단호한 결정은 북한에 직접적인 경고가 되었다. ▲ 시리아의 화학무기 공격에 대한 미국의 단호한 대응은 중국 뿐 아니라 북한에게도 충격이었다. 그동안 유엔에서 이뤄진 의미 없는 토의와 결의안, 비난의 말을 벗어나 트럼프의 예상 밖의 단호한 결정은 북한에 직접적인 경고가 되었다. 트럼프가 러시아, 이란과 한 편인 시리아에 공습을 명령할 수 있다면 중국과 동맹관계인 북한에 대해서는 왜 못하겠는가? 순항미사일로 북한 미사일 시설을 공격한다면 어떻게 되겠는가? 영변에 있는 북한의 핵무기 시설을 공습한다면 어떨까? 미국 플로리다에서 열린 세계 1위, 2위 부자 국가 대통령들 간 정상회담은 다음의 두 가지 이유 때문에 용두사미가 되었다. 첫째, 트럼프 미국 대통령과 시진핑 중국 국가주석이 플로리다 마라라고에서 환담을 하고 있을 때 트럼프 대통령은 시리아 반군이 장악한 마을에 화학무기를 무자비하게 사용한 바사르 알 아사드 시리아 정권의 공군 기지를 공습하는 명령을 내렸다. 화학무기로 죽은 사람들과 고통스러워하는 아기들의 모습은 트럼프를 포함해 세계를 경악시켰다. 미국의 이 대응은 트럼프-시진핑 간 정상회담을 완전히 무색하게 했다. 세계적인 측면에서 중요한 것은 아사드가 전에 화학무기를 사용했을 때 징벌할 기회가 있었음에도 장황하게 말만 늘어놓다 결국 아무것도 하지 않은 버락 오바마 전임 대통령의 우유부단함과는 달리 트럼프는 단호하게 행동했다는 점이다. 둘째, 트럼프-시진핑 간 정상회담은 실질적인 성과를 내지 못했다는 점에서 거의 의미가 없었다. 물론, 그들은 악수를 했고 미소를 지으며 북핵 문제 해결을 위해 함께 노력하자고 말했다. 하지만 이런 이해를 위해 두 정상이 마라라고에서 24시간 동안 와인을 마시고 저녁을 먹으며 수다를 떨 필요는 없었다. 시진핑이 트럼프에게 중국이 북한의 핵프로그램 개발을 멈추게 할테니 중국의 막대한 대미 무역흑자를 이유로 미국이 중국을 처벌하겠다는 생각을 재고하라고 말했는지 우리는 모른다. 뉴스 독자들과 관측자들은 플로리다 정상회담에서 나오는 의례적인 말들에는 관심이 없다. 시진핑이 미국의 시리아 공군기지 미사일 공습 소식에 충격을 받았을지라도 만찬 자리에서는 이 감정을 감췄을 것이다. 시진핑이 태도를 180도로 바꿔 북한을 엄중히 다루겠다고 했는지도 알 수 없다. 의례적인 진부함 가운데 시진핑과 트럼프는 어떤 것도 동의하지 않았다. 일반적인 내용을 동의하는 공동성명조차 없었다. 그러나 시리아의 화학무기 공격에 대한 미국의 단호한 대응은 중국 뿐 아니라 북한에 충격이었다. 그동안 유엔에서 이뤄진 의미 없는 토의와 결의안, 비난의 말을 벗어나 트럼프의 예상 밖의 단호한 결정은 북한에 직접적인 경고가 되었다. 북한의 대응은 이번 공습이 야기한 두려움을 보여주고 있다. 북한은 이 공습은 용서할 수 없는 것이라고 비난하면서 북한 핵개발 프로그램의 필요성을 보여주는 단적인 예라고 말했다. 북한의 즉각적인 반발은 북한이 제조하는 스커드와 노동 미사일을 수년간 구입한 시리아와 북한 간의 가까운 관계를 보여줬다. 지금 관심은 트럼프가 북한의 미사일 발사 시설 혹은 영변 핵시설을 순항미사일로 공격을 할 수 있지 않을까 하는 것이다. 가능성은 낮아 보이지만 미국이 시리아 공군기지를 공습한 것을 볼 때 훨씬 현실적이다. 트럼프가 미국 본토에 핵탄두를 실어 나를 수 있는 북한의 대륙간탄도미사일이 발사되는 일은 절대 일어나지 않을 것이라고 말한 것을 우리는 잊을 수 없다. 트럼프는 이란이 핵탄두를 개발하지 않겠다고 합의한 협정에 회의적이었다. 이란은 시리아보다 북한과 훨씬 가까운 관계다. 이란은 핵기술을 북한에 제공하면서 북한 미사일을 수입해왔다. 미국의 시리아 공습을 보면서 이란은 핵개발을 하지 않겠다는 협상을 지킬 것인지 아니면 시리아에 더 많은 무기를 공급할 것인지 지켜볼 일이다. 미국의 시리아 공군기지 공습은 중국의 대응이 어떠했는지 등 광범위한 질문을 떠올리고 있다. 트럼프는 시진핑과의 정상회담에서 시리아 공격을 명령했다고 시진핑에 귀띔을 했을까? 그들이 북한에 대한 협력을 운운하며 정상회담을 마칠 때 시리아 공습에 대해서는 뭐라고 말했을까? 트럼프는 서울 남쪽의 롯데 골프장에 배치되는 사드는 중국이 아니라 오직 북한 공격 방어용이라고 거듭 말했을 것이 분명하다. 하지만 중국은 미국이 시리아를 공습하는 것을 본 후 이 주장을 더 믿지 않을 것이다. 중국 관영통신인 신화사는 미국의 시리아 공습은 미국이 발전된 전투기와 순항미사일로 다른 나라들을 공격할 수 있다는 강력한 정치적 메시지를 보내려는 미국의 전술이라고 평가했다. 다른 중국 언론들도 비슷한 논평으로 비판했다. 만일 트럼프가 순항미사일, 폭격기 등을 보내 북한 내 목표물들을 공격한다면 중국의 대응은 대단할 것이 분명하다. 미국의 시리아 공습은 북한이 바로 그 다음 차례일 수 있다는 것을 의미한다. U.S. Cruise Attack in Syria Shocks Trump-Xi Summit, Raises Question: Will N. Korea Be Next U.S. Target? The summit in Florida between the presidents of the world's two wealthiest countries turned out to be a terrific anti-climax for two reasons. First, while President Trump and China's President Xi Jinping were chatting at Mar-a-Lago, Trump ordered cruise missile strikes on the base from which the Syrian regime of Bashar Al-Assad had staged a ruthless attack with chemical weapons on a rebel-held town. The spectacle of dead and suffering babies, victims of chemical weapons, transfixed the world, including Trump. The U.S. response completely wiped the Trump-Xi summit from top position in the news. As far as the world was concerned, all that mattered was that Trump had acted decisively after years of indecision by his predecessor Barack Obama, who waffled, compromised and finally did nothing when he had a chance to punish Assad for previous chemical attacks. Trump proved that he had the guts, which Obama did not. The second reason why the Trump-Xi summit was almost meaningless was that it produced little of real substance. Certainly, they shook hands, smiled and resolved to work together on the North Korean nuclear issue. They did not, however, have to go to the trouble of 24 hours of wining and dining and schmoozing in Mar-a-Lago to come to this understanding. We still don't know if Xi talked Trump out of any ideas of punishing China for its huge trade surplus with the U.S. in exchange for China getting North Korea to halt its nuclear weapons program. News readers and viewers paid little attention to the polite words emanating from Florida. If Xi was shocked when informed of the cruise missile strike in Syria, he hid his emotions in the presence of his host. Nor is there evidence that Xi is doing an about-face and taking stringent action to force North Korea's hand. Beyond the usual platitudes, he and Trump agreed on nothing. There was no joint statement, no final joint communique on which they agreed even in generalities. The decisive U.S. response to Syria's chemical warfare attack, however, had to have come as a shock to the North Koreans as well as the Chinese. The sudden unexpected order from Trump to go beyond words of condemnation, beyond endless discussions and resolutions in the United Nations, was a direct warning to North Korea. If Trump could order a strike against Syria, in defiance of its ties with Russia and Iran, why not against North Korea, allied with China? What about a few cruise strikes against North Korean missile sites? And how about bombing North Korea's main nuclear weapons complex at Yongbyon? North Korea's reaction revealed the fears the strike engendered. Swiftly condemning it as "unpardonable" a North Korean spokesman said it proved the need for North Korea's nuclear program. The quick response from Pyongyang reflected the close ties between North Korea and Syria, which has purchased North Korean Scud and Rodong missiles for years. The question now is whether Trump might consider cruise missile strikes against missile launch sites in North Korea -and even against the nuclear complex at Yongbyon. That possibility may, seem remote but is far more realistic in view of the attack on the Syrian base. 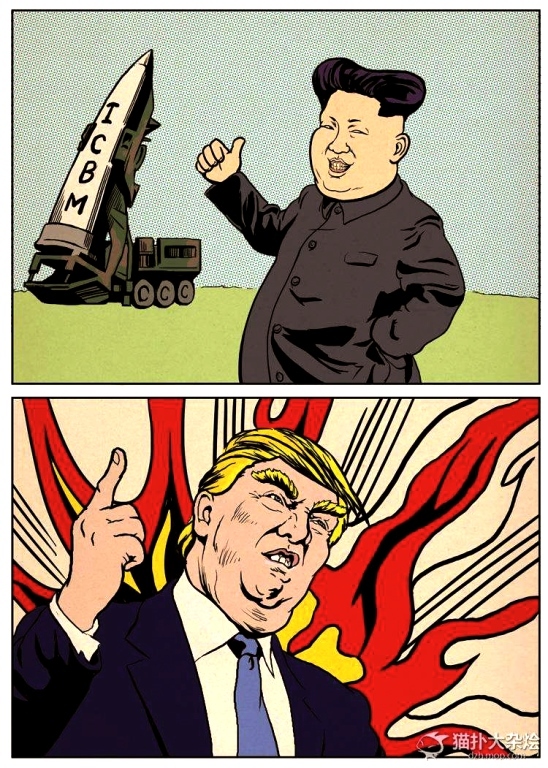 Nor can we forget that Trump has said that the launch of an intercontinental North Korean missile capable of carrying a nuclear warhead to American soil would "never happen." Trump also has been skeptical of the agreement under which Iran agreed not to attempt to build nuclear warheads. Iran if anything has been much closer than Syria to North Korea, from which it's imported missiles while exchanging nuclear technology. Will Iran, in view of the attack on Syria, want to stick to this deal, and might Iran rush to support Syria with weapons? The attack on the Syrian site raises far-ranging questions, not least of which is what response to expect from China. Did Trump give Xi any advance inkling that he had ordered the attack, and what did they say about it over dinner as their summit was winding up in an exchange of happy-talking pledges to cooperate on North Korea? No doubt Trump repeated U.S. assurances that installation of THAAD, Terminal High-Altitude Area defense, that is, a battery of counter-missiles on a Lotte golf course south of Seoul, was strictly for defense against North Korea, not China, but China would be still less likely than ever to accept that reassurance after a display of U.S. military might in the middle east. The Chinese media, led by Xinhua, the official news agency, called the U.S. response in Syria a "tactic of the U.S. to send a strong political message by attacking other countries using advanced warplanes and cruise missiles." Other Chinese commentaries were equally critical. No doubt the Chinese response will be still more fierce if Trump sends cruise missiles, bombers and attack planes against targets in North Korea. The attack on the Syrian base means North Korea might just be next.